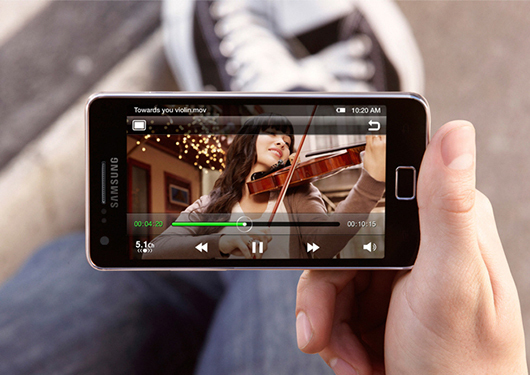 Samsung Galaxy S II is an Android smartphone and currently the second thinnest Dual-Core smartphone in the world. 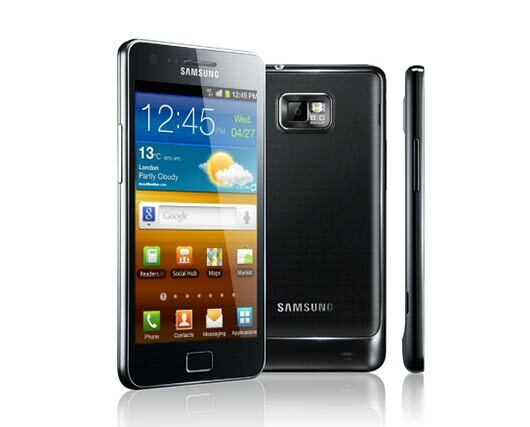 The Samsung Galaxy S II GT-i9100 is an Android smartphone and currently the second thinnest Dual-Core smartphone in the world. This mobile phone is the successor to the equally popular Samsung Galaxy S, which sold around 10 million units worldwide. The Samsung Galaxy S2 phone is launched from Samsung in India, runs on latest Android 2.3 OS. The Samsung Galaxy S2 is powered by Dual Core Application Processor and 1GB RAM. The Galaxy S2 features 32GB built-in memory, external memory support, a 8 megapixel camera, HD video playback and recording, NFC, Wi-Fi, HDMI and A-GPS. It comes with the Android 2.3 Gingerbread OS, and an even larger screen at 4.3 inches of Super AMOLED Plus goodness. 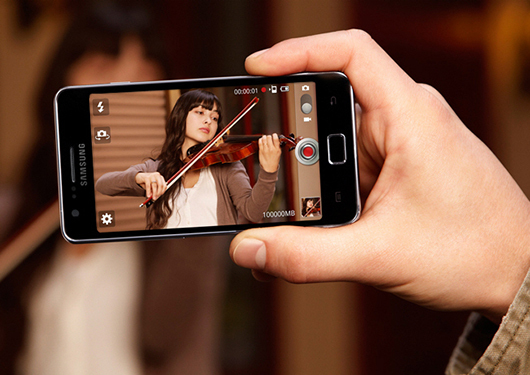 The Galaxy S II upgrades the camera to 8MP and adds an LED flash to it, together with 1080p video recording. Display – Super AMOLED PLUS display technology, wide 4.27 inch screen,0.2mm thin panel, .01 milliseconds response time and no motion blur. Processing – Cortex A9Dual Core Application Processor with 1.2 GHz processing power. Design – The lightest and slimmest dual core smart phone – 116 grams and 8.49mm thick, premium metallic skin, depth and tactile surface for a better grip. Connectivity – HSPA+ 21Mbps download speed (1GB can be downloaded in 390 seconds), upload speed of 5.76Mbps, USB port, Bluetooth 3.0+ HS with 24Mbps speed. Other Features – High Resolution 8 Mega Pixel camera, 4x digital zoom, special LED flash, Full HD video capture at 1920 X 1080p at 30fps. If you’re planning to buy a smartphone today, the Galaxy S II would be the clear choice. Sometimes it’s just as simple as that. Samsung Galaxy S II is available at Vodafone Stores from June 3 and at other retail stores from June 9. This Samsung Galaxy S II Dual core processor-powered smartphone will be sold for Rs 30,498 in India as per Samsung India official website.